We see and hear about the effects of dry winter air all the time: My skin feels soo dry. No matter what I do, I can’t get the static out of my laundry! Why won’t this door close properly? Another day, another nose bleed. Dry air and low indoor humidity can have negative and damaging effects this time of year. But with a little know-how and a few key tools, you can get your humidity levels back in check and turn your home into a winter haven. Indoor air quality takes a major hit. When the temps drop, we naturally crank up the heat. To that we say: not so fast. Turning up the heat can exacerbate the effects of dry winter air. Heating systems not only circulate warm air, but also degrade air quality by spreading pollen, germs and dust. You’re more likely to get sick. Dried-out nasal passages have reduced ability to trap viruses and other harmful particles. In other words, there are more things floating around in the air that can make you sick, and your respiratory system is less equipped to deal with them. So not only do dry air symptoms include chapped lips, nose bleeds, cracked, itchy skin and a dry air sore throat, you’re more likely to get colds, sinus infections, the flu and suffer from allergies. It can wreak havoc on your home and valuables. Dry air can damage drywall, wooden trim and hardwood floors, and some of your most prized personal possessions. Things like musical instruments, books and artwork are at risk when subjected to extended periods of dry air. Want to maintain optimal humidity throughout the winter? For starters, measure and monitor the humidity levels in your home. 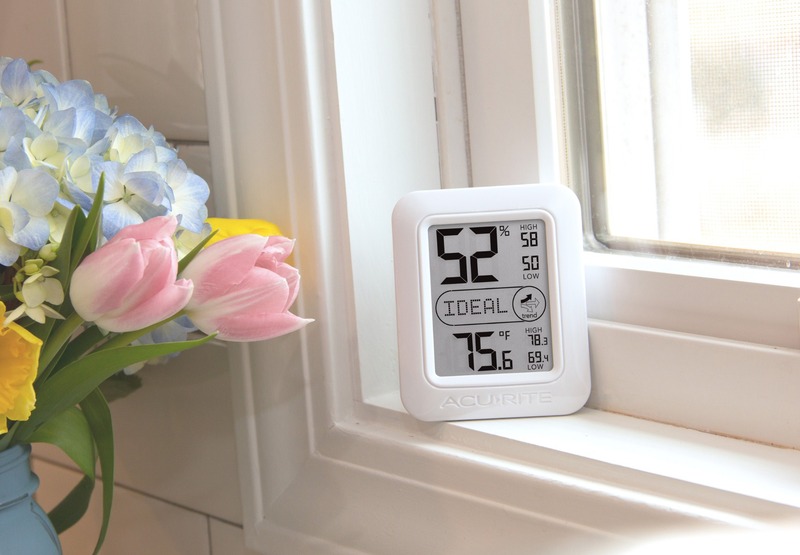 AcuRite weather stations show indoor humidity on their displays, so you can track all your outdoor and indoor data in one place. Not a huge weather enthusiast? No problem. Our home monitoring systems keep it simple and track temperature and humidity in various locations around the home. Used in conjunction with a regularly maintained humidifier, you can skip the negative effects of dry air this winter. I told a friend that he need humidity in her apt and gave her a couple of reasons. She said she was comfortable with it. I'm going to read this page to her. It explains it better than I can. My humidity right now is 16% and I'm cold, dry mouth. I need a new humidifier /now. Nice article, but you forgot to mention how do you raise the humidity in your home during the winter months? especially when the humidity is so high outside working against you. The best way to add humidity into your home is by running a humidifier. You can also raise the humidity in your home by cooking on your stove top. Try to avoid using your oven though as that is drying and remove moisture from the air rather than add it.